The video goes over what ADS-B is, how to receive it, and then goes on to explain a bit of the MATLAB code. This is a good introduction for people wanting to use an RTL-SDR in MATLAB, or for anyone wanting to learn about ADS-B. 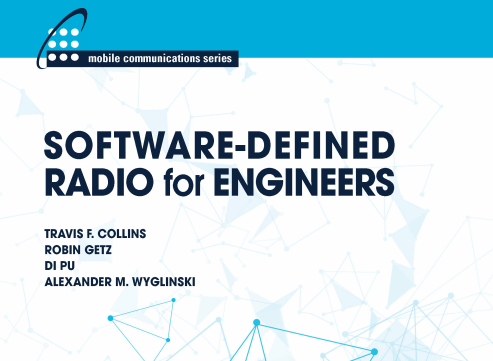 On the 26th of August a new technical text book titled “Software Defined Radio using MATLAB® & Simulink® and the RTL-SDR” is due to be released for free in eBook form and in print form for an as of yet unknown price on Amazon. The book is written by four members of the Department of Electronic and Electrical Engineering at the University of Strathclyde in Scotland. MATLAB is a technical computing language and software suite used commonly by professional and student scientists and engineers. It is similar to GNU Radio in terms of its digital signal processing (DSP) capabilities. Back in January 2014 the MATLAB team released an update which enabled the RTL-SDR to be used as an RF input device. The availability of the RTL-SDR device for less than $20 brings software defined radio (SDR) to the home and work desktops of EE students, professional engineers and the maker community. The RTL-SDR can be used to acquire and sample RF (radio frequency) signals transmitted in the frequency range 25MHz to 1.75GHz, and the MATLAB and Simulink environment can be used to develop receivers using first principles DSP (digital signal processing) algorithms. Signals that the RTL-SDR hardware can receive include: FM radio, UHF band signals, ISM signals, GSM, 3G and LTE mobile radio, GPS and satellite signals, and any that the reader can (legally) transmit of course! In this book we introduce readers to SDR methods by viewing and analysing downconverted RF signals in the time and frequency domains, and then provide extensive DSP enabled SDR design exercises which the reader can learn from. The hands-on SDR design examples begin with simple AM and FM receivers, and move on to the more challenging aspects of PHY layer DSP, where receive fi lter chains, real-time channelisers, and advanced concepts such as carrier synchronisers, digital PLL designs and QPSK timing and phase synchronisers are implemented. In the book we will also show how the RTL-SDR can be used with SDR transmitters to develop complete communication systems, capable of transmitting payloads such as simple text strings, images and audio across the lab desktop. While the book is not yet released the full table of contents is currently available for viewing on their downloads page. From looking at the table of contents, we can see that the text book looks very comprehensive and will likely be extremely useful for students who are learning RF and DSP concepts in university level classes. The team behind the book (desktopsdr.com) also have a YouTube channel where it appears that they are releasing supporting videos. We will post again when the book is released. 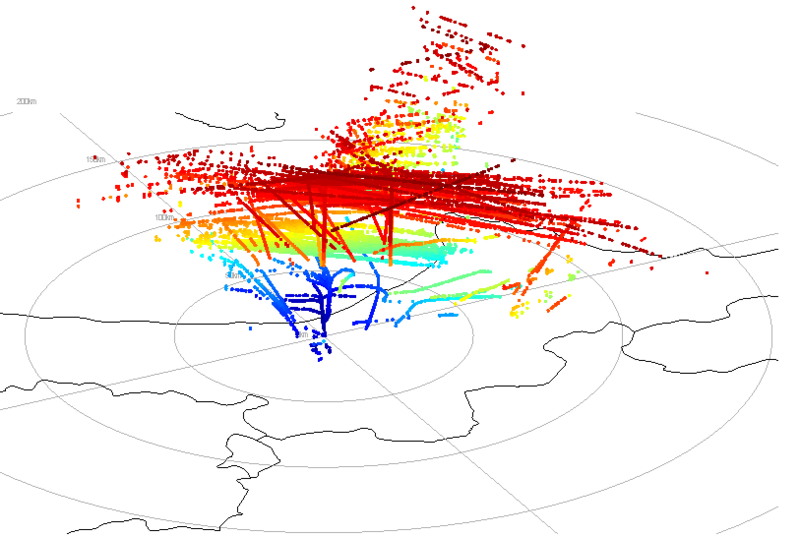 Over on Reddit user JorgeGT has posted an animated 3D visualization of his local ADS-B air traffic data using a MATLAB script he wrote. The script collects data from a dump1090 server. If you have a copy of MATLAB, his code can be downloaded from Github here. To run the code JorgeGT writes that you’ll need to do the following. Get dump1090 running on an accessible server: http://url:8080. Get countries/states/provinces SHPs from Natural Earth if you want them to show them and store them in a folder called 10m_cultural. Have a look at my MATLAB script and try to run it. VHF Omni Directional Radio Range (VOR) signals are used in aviation as a short range radio navigational system. 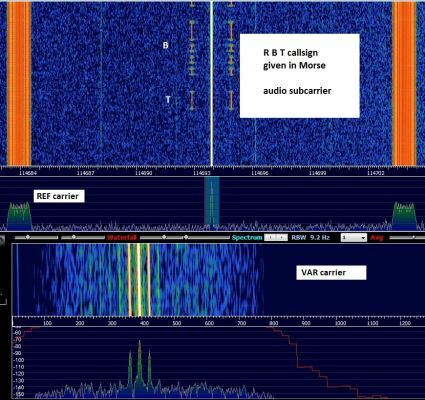 Amateur radio hobbyist F4GKR decided to study these VOR signals by recording them using his RTL-SDR, and then analyzing them in MATLAB. On his post he shows his method of analysis and discusses his results. The Communications System Toolbox in MATLAB 2013b now supports the RTL-SDR dongle. MATLAB is a scientific computing software product which scientists and engineers use for complex technical computations and simulations. The RTL-SDR radio support package enables you to design wireless receivers using real world signals. Using Communications System Toolbox™ in conjunction with an RTL-SDR USB radio, you can design and prototype systems that process real-time wireless signals in MATLAB® and Simulink®.